Find a table, counter or other washable surface and empty out your makeup bag or drawer. (Don’t dump it on your bed like I did once because it gets the makeup all over everything and it’s hard to clean off.) . 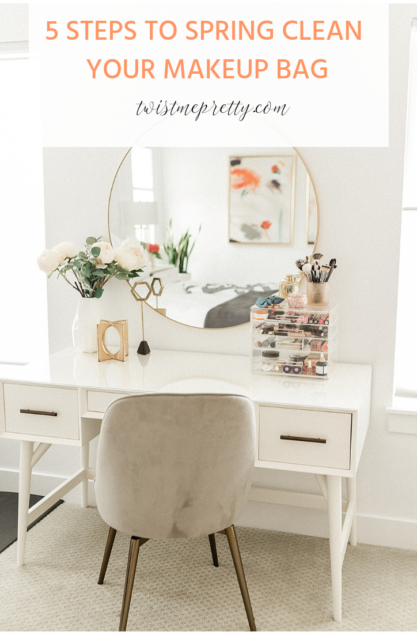 Getting everything out of your bag will force you to pick everything up and make a decision whether there really is space in the drawer for that item, it’s a very Marie Kondo approach haha. While the drawers are empty, take this opportunity to clean them. This will give you a fresh start when you are adding your items back in. 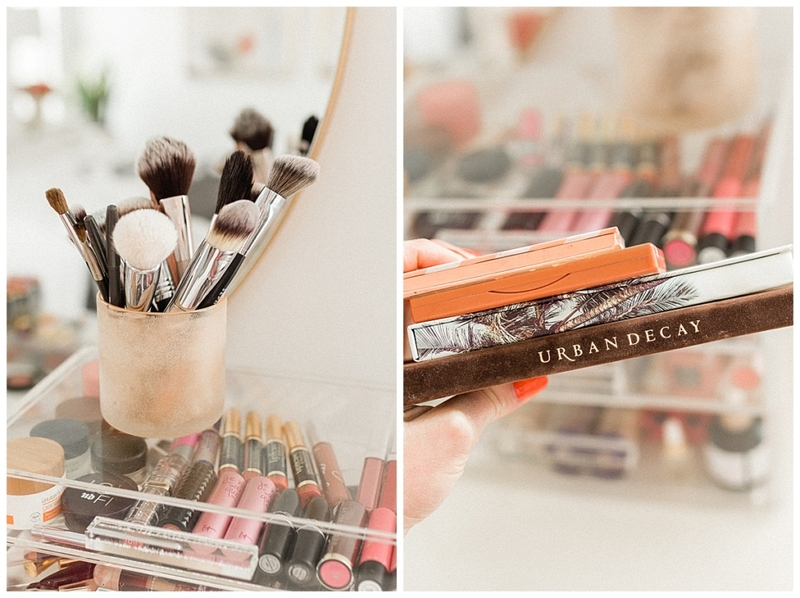 If you don’t have drawers, either ditch your old makeup bag for a new one, or clean it out as best you can. If I can recommend, I’ve had this Cosmo Cube for a few years now and it’s held up so well. It looks so beautiful on my vanity and holds SO much makeup! 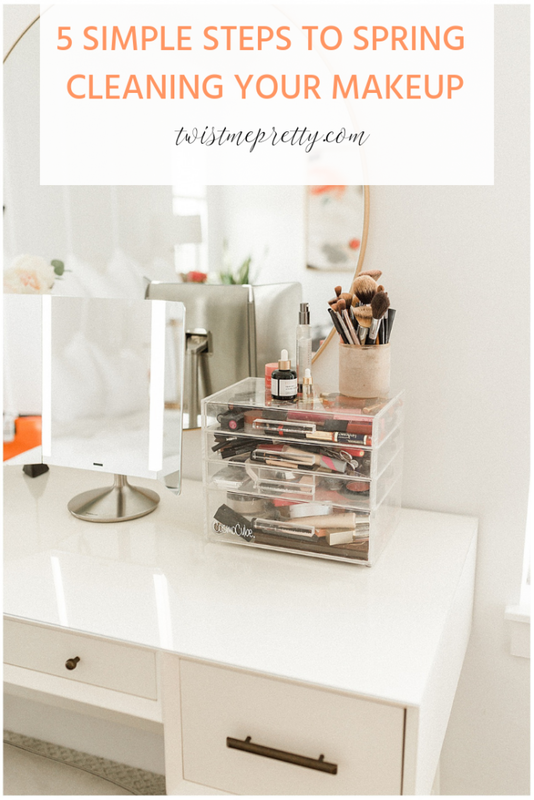 I loved getting everything out of my bag and being able to truly organize my products vs throwing them all in a large bag. 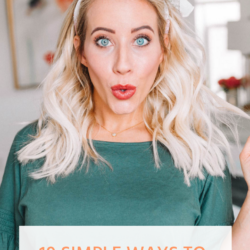 In this step, you are going to be making the hard decisions, but I’m going to make it super easy for you. 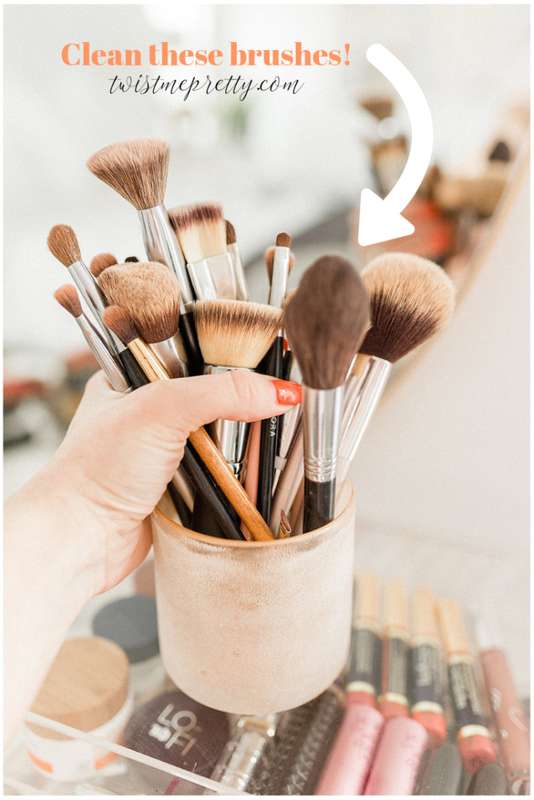 First, throw away all of the expired makeup. 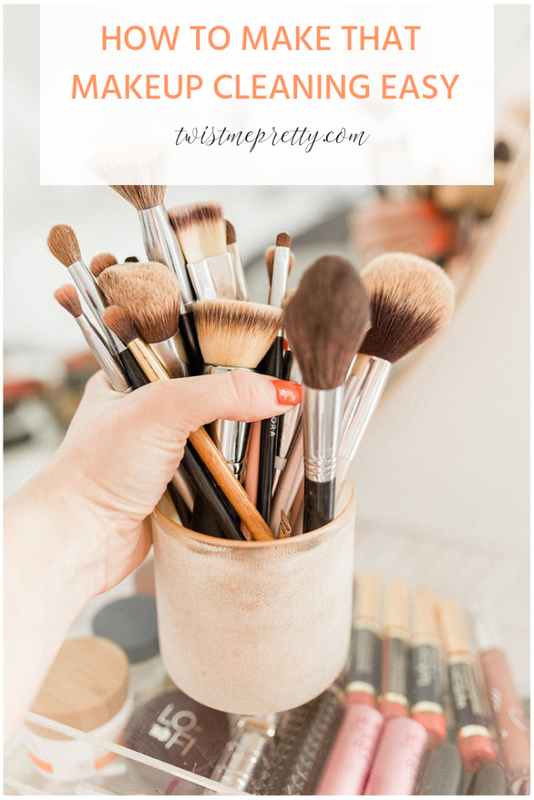 Most makeup will not have an expiration date but will have a stamp on the back telling you how long a product will last. 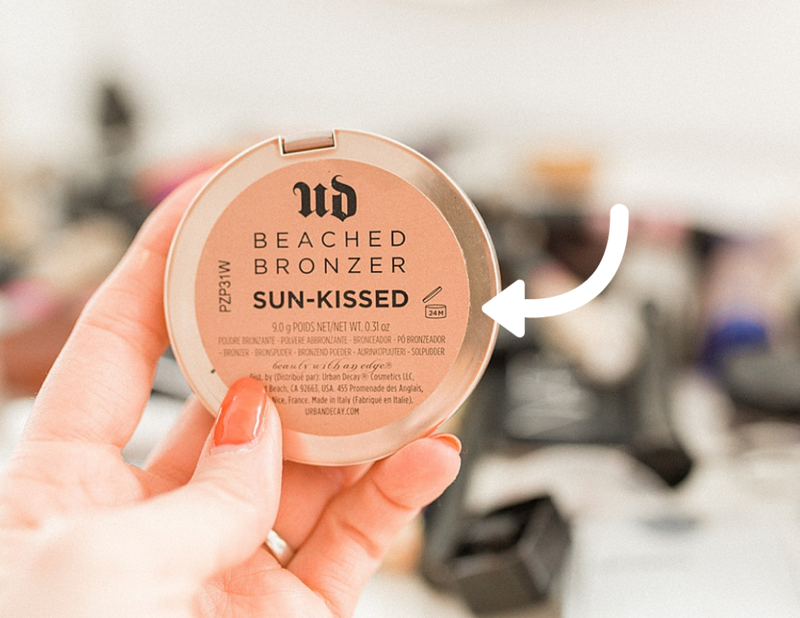 See that 24M symbol on the back of this beached bronzer? 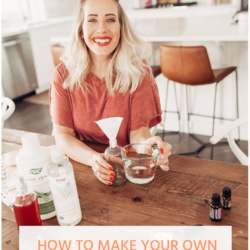 This is a rule I choose when to follow based off how much I like and use the product and how invested I am in getting something new. 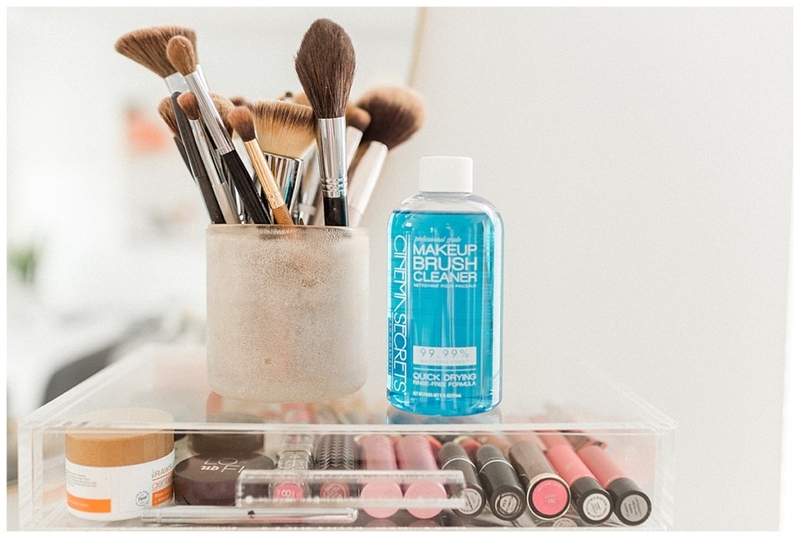 Next, toss the makeup that you have never used. I know, I know. You think that you are really going to wear it, but if you haven’t worn it in the last eight months, it is probably time to say goodbye. Last, get rid of the duplicates. If you’re like me, sometimes you buy the same or similar product over and over again without realizing you have something similar at home. You probably need only one of these items. 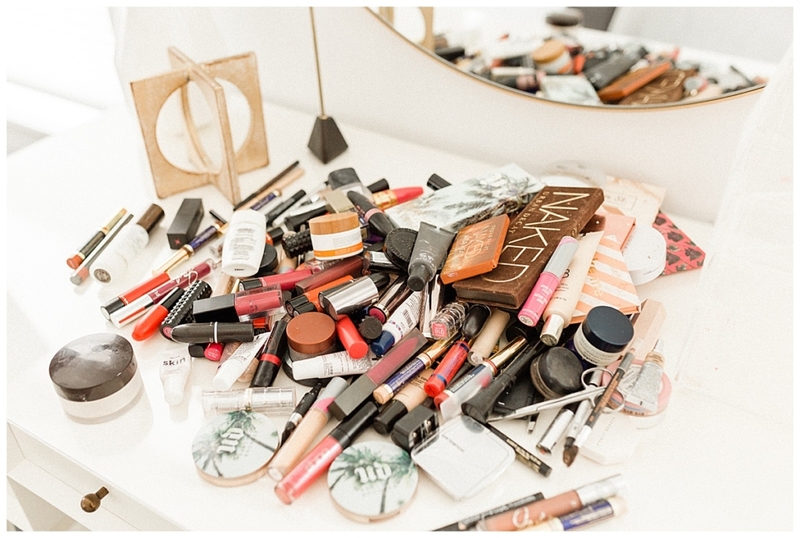 Choose the best one and toss or store the other one in a different place so it’s not cluttering up your makeup bag! 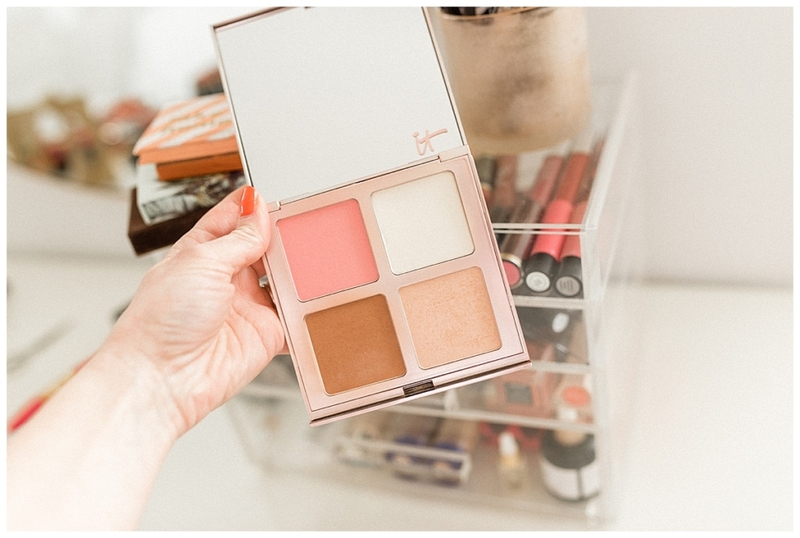 I have a lot of make up palettes and color schemes that are really only appropriate in the Fall/Winter. 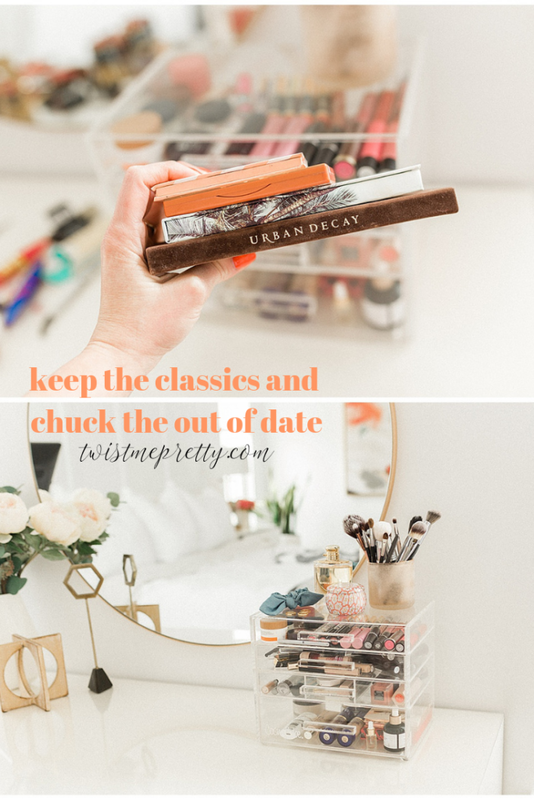 Take this time to put away those winter colors, your wine lipsticks and moody eyeshadow palettes and pull out your favorite Spring/Summer makeup from the year before. Don’t have any? Well it’s the perfect time to splurge! Go buy a new palette or some fresh Spring lipsticks to get you going. Also remember, makeup trends come and go. So, when a trend is out, it is okay to let that makeup go. 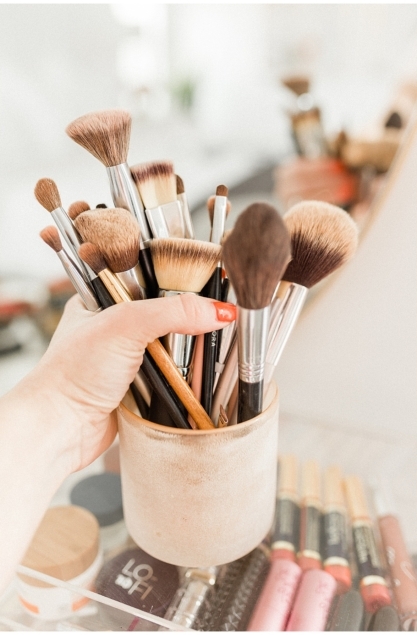 Experts say that you are supposed to wash your brushes once a week. Yikes! I don’t do it that often, but I do like to take this time to wash my brushes. This gives me a clean start. 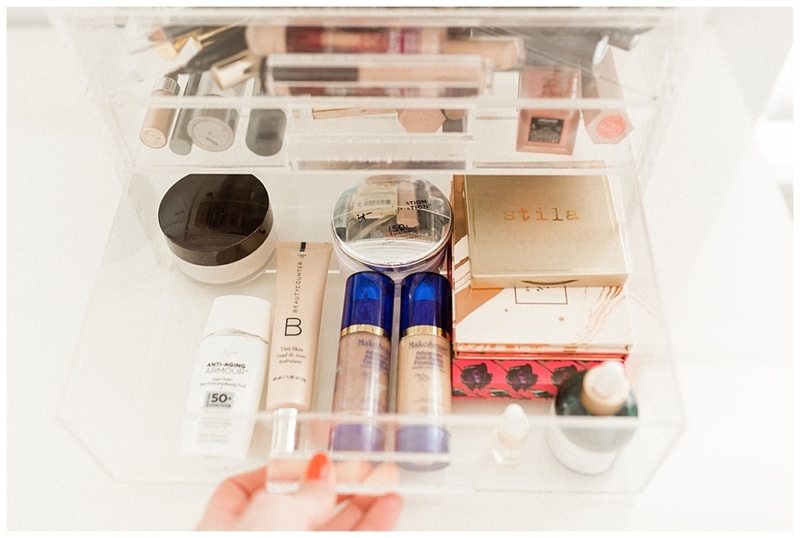 Because I use the Cosmo Cube (it’s pricey I know but a worth while investment), I like to organize by product type. 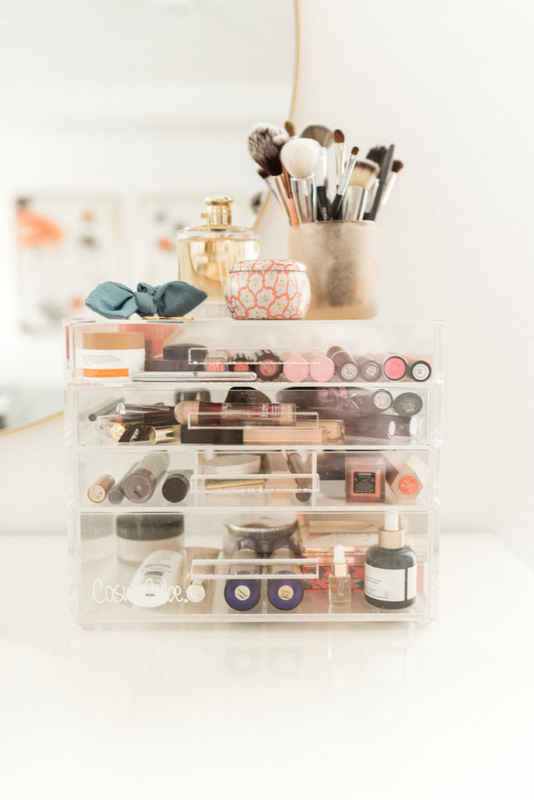 I put my lipsticks in the top drawer, eye products in the second drawer, skin products in the third drawer and then bulkier items in the drawer on bottom. 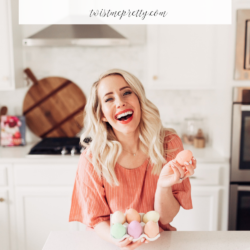 Having everything sorted and organized makes finding what I want super easy and quick! 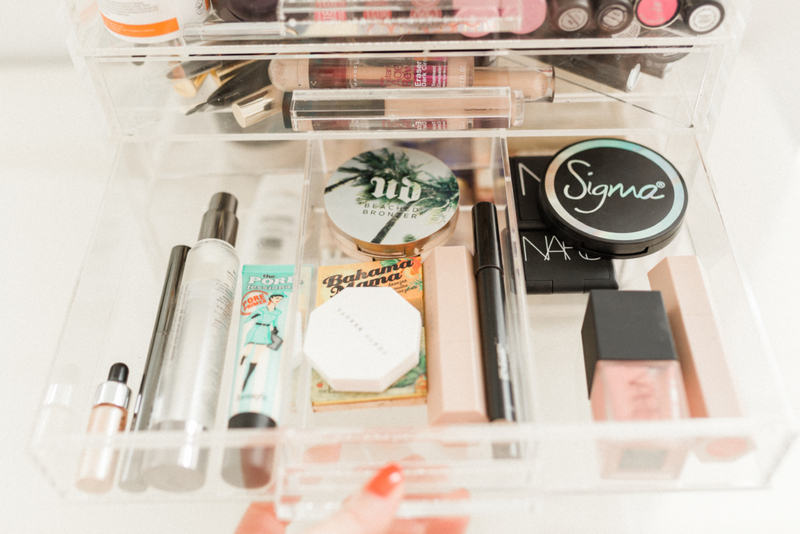 The Cosmo Cube has little slots in two of the drawers that help with organization. My eyebrow pencils are on the left, my concealers are in the front, my extras are in the back and my mascaras are on the right. 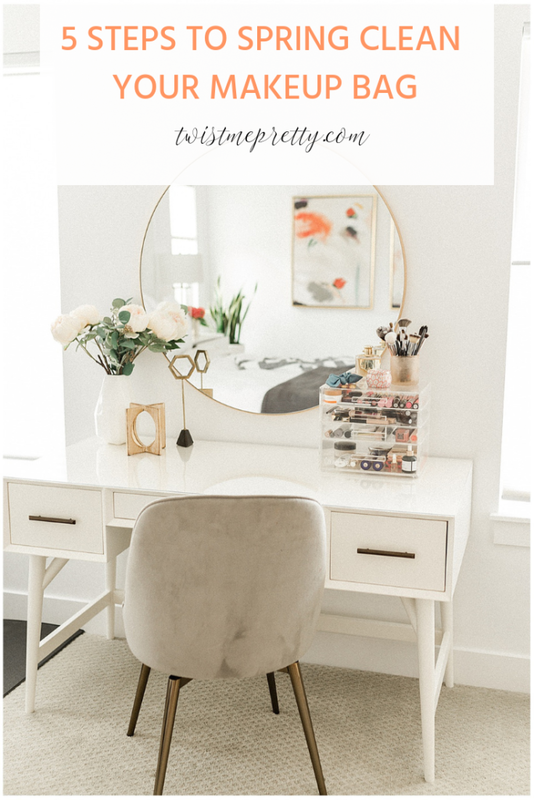 I can see everything I have at a glance and know when I do and don’t need new products! In my skin drawer I have my primers on the left, highlighters in the middle and blush on the right! What do you think? I’d love to know what makeup you threw away in the comments. 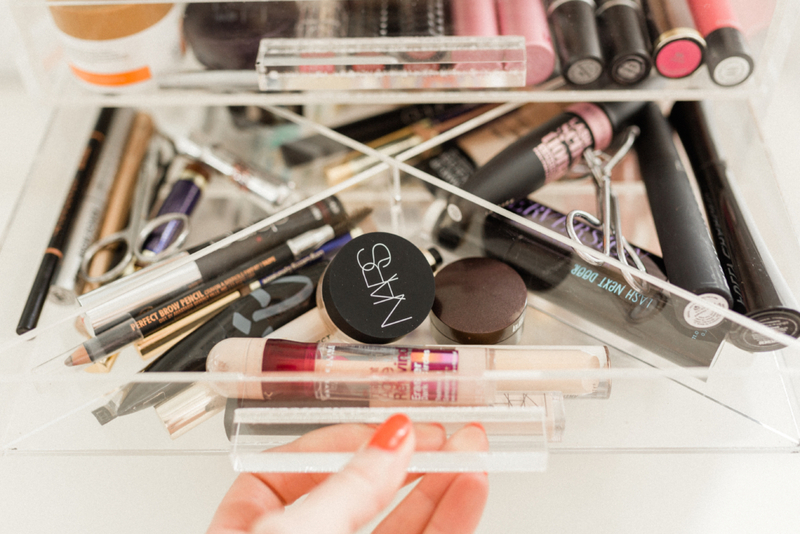 Having my makeup cleaned out makes it so much more fun to get ready in the morning. No more fumbling around my messy drawers. Now I know exactly here everything is and it makes me so so happy! It’s the little things in life babes, it’s always the little things!